My son and I have been writing a report for a recycling project and thought you might find it interesting. 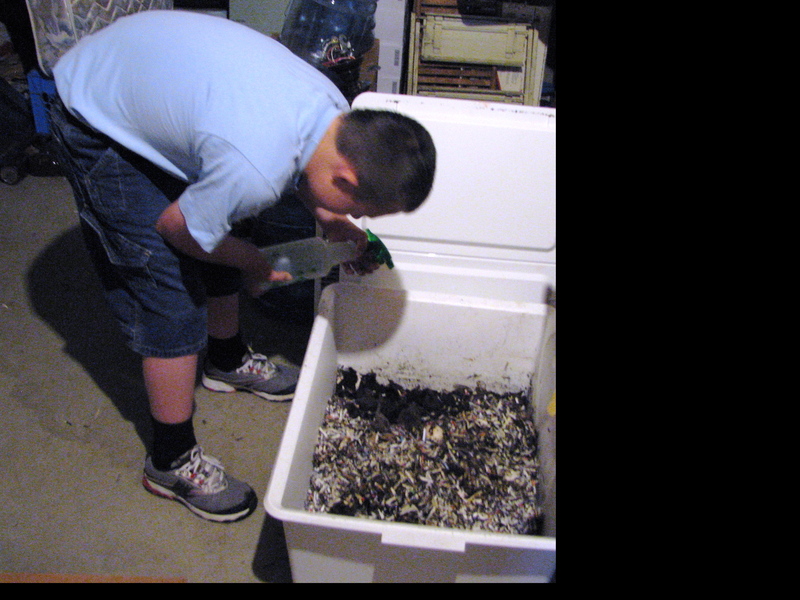 The worm project has been fun, economical, easy and very do-able for my Down Syndrome son. This is a great learning project for anyone wanting to learn about composting! It would be a great project for any classroom, home, daycare, or senior center. Composting is the process of collecting kitchen, yard, and livestock waste and allowing it to break down into usable dirt called humus. Composting takes place over time as heat, moisture, and bacteria work together to break down “green” and “brown” plant material. Composting is fun because you get to watch the recycling happen; unlike taking plastic, glass, cans, mixed paper, newspapers, and cardboard to the recycling bin and leaving it there. Did you know the U.S. EPA estimates that each American throws away an average of 1.3 pounds of food scraps daily. The combination of this food waste, along with yard trimmings, makes up 24 percent of our nation’s municipal solid waste stream. Vermiculture uses worms to decompose kitchen and yard waste into humus through vermicomposting. 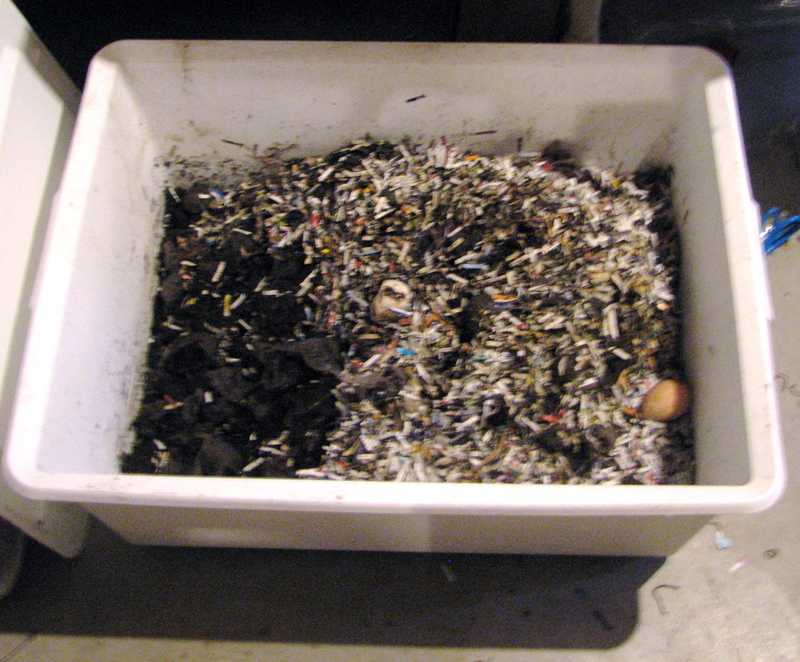 Vermicomposting breaks down organic matter faster than regular composting. Vermicomposting can be done inside or outside as long as the temperature is between 40 and 80 degrees F.
Vermicomposting can be managed in apartments and small containers. Verimicomposting does not usually smell. Worms love to eat your kitchen scraps except onions and citrus. Did you know vermicomposting is done all over the world to help reduce organic waste in trash-dumps. Some people make a living, and others supplement their income growing worms and making compost. You need a bin to grow the worms in. You could recycle a dresser drawer, wooden box, or plastic tub. Drill a few air holes for ventilation. You will need a lid to keep the worms in the dark and keep the bedding moist. Drill a few holes for ventilation. In the bottom add about 1 inch of clean sand then sprinkle an inch or two of soil. Top with 6-10 inches of shredded newspapers, dry leaves, or sawdust. Mist the litter until wet but not spongy and continue misting each week to keep the soil moist. Feed kitchen scraps once a week. This can include coffee grounds and filters, vegetable and fruit waste, and egg shells. Reduce the amount you feed if they don’t eat it between feedings. Keep the worms fed and watered for about 2 1/2 to 3 months then remove 1/3 of the worms and compost, add new litter and begin again. How many worms do I need to start? The most frequently suggested compost worm is a red worm, or red wiggler. These worms reproduce quickly and can eat more than their own weight in food each day. Note that these are not the same as the earthworms you see on the sidewalk after a rainstorm. It is best to use 2 pounds of worms, or about 2,000 worms, for each pound of daily garbage. The average family of four generates about 7 pounds of compostable waste each week. What do you feed the worms? The worm-to-food ratio should be 2-to-1. Bury food at least 3 inches into the bedding, changing locations each time. But before burying it, remember that worms do not have teeth. It is much easier for them to eat if the food is blended or frozen and then thawed to be smaller and softer. It is not recommended to compost meats, dairy products, oily foods and bones because of problems with odors and pests. Worms also do not like onion skins or citrus, so these may be used, but should be kept to a minimum. This entry was posted in DIY, gardening, Uncategorized and tagged composting, educational project, vermiculture, worm composting, worm farm. Bookmark the permalink. Very good blog! Do you have any hints for aspiring writers? I’m planning to start my own site soon but I’m a little lost on everything. Would you suggest starting with a free platform like WordPress or go for a paid option? There are so many options out there that I’m totally confused .. Any suggestions? Thank you! Know your stuff, know your audience, and explain everything as if your audience know’s nothing of the topic! Think about which word best describes what you are trying to say and let your personality shine through. Conventions are guidelines that are meant to be stretched occasionally.